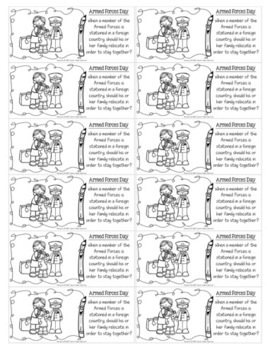 This Armed Forces Day writing prompts resource includes 15 Armed Forces Day themed prompts to get students thinking and writing about Armed Forces Day and the associated experiences and activities. This is aligned with 3rd grade common core, but may stretch to other grades depending on writing and reading proficiency. Please download the preview file for a sample view of this resource. Please ensure that it is appropriate for your grade level prior to purchasing. There are 5 writing prompts for each of the following categories: opinion writing, informative/explanatory writing, and narrative writing. We have also included mini versions of each writing prompt that can easily be pasted into an interactive notebook or writing journal and completed therein. 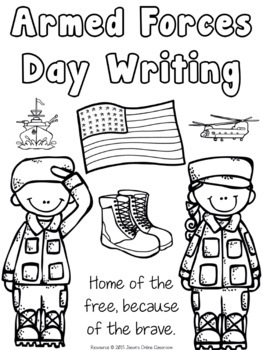 Additionally, there is a cover page that can be colored by the students and stapled to their completed writing prompts. We really do care about each of our customers and we make sure we do everything in our power to provide you with quality resources. 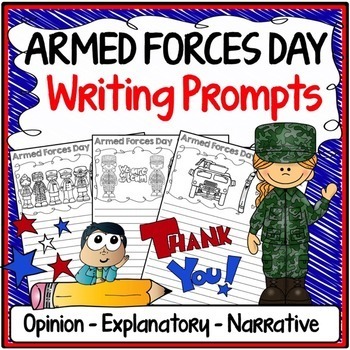 We hope you enjoy these Armed Forces Day writing prompts!